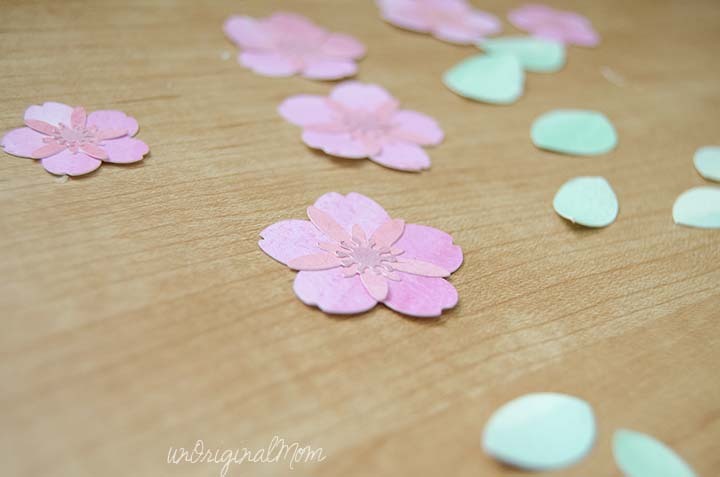 This project began as a rather epic and disappointing craft fail…but had a happy ending! (Don’t you just love those? The happy endings, I mean.) 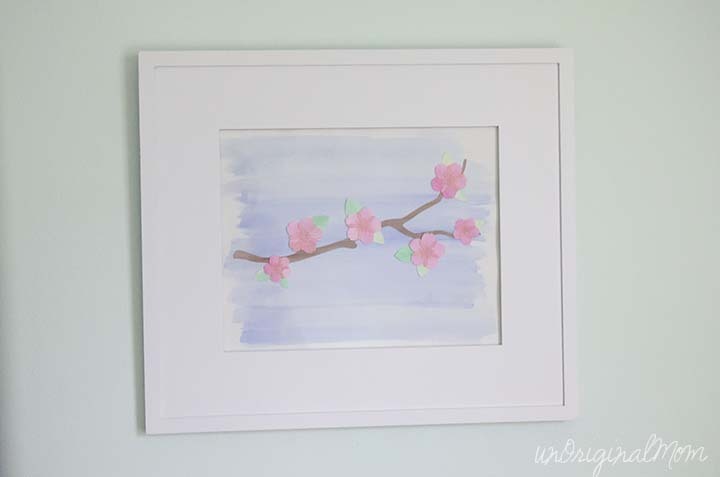 I began with this beautiful watercolor inspiration from Allison over at Dream a Little Bigger – she created some stunning wall art with her Silhouette sketch pens and watercolors. I attempted my own with some rather dismal results. Let’s start at the beginning of the story. We are getting ready to transition our 2-year-old out of the nursery and into her “big girl bedroom.” You can click through to my Pinterest board to see some of my inspiration for her room…we’ve already got the walls painted a light mint-ish green and are going for pink and gray accents in the room. 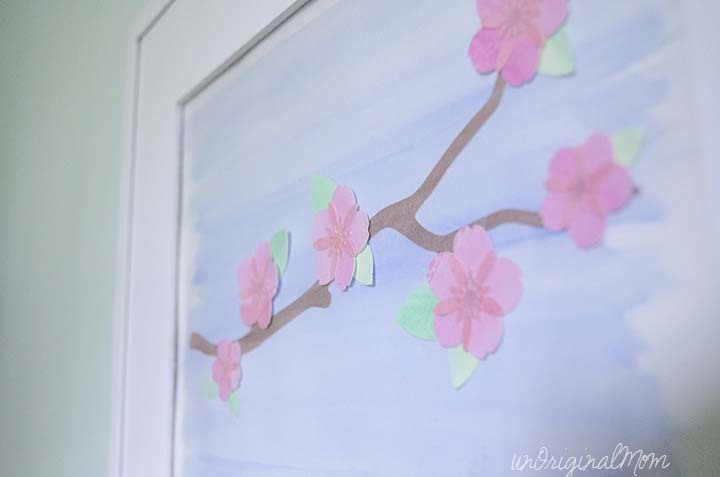 I absolutely love cherry blossoms – so feminine and beautiful without being obnoxiously pink – and knew I wanted some cherry blossom wall art to add to her room. 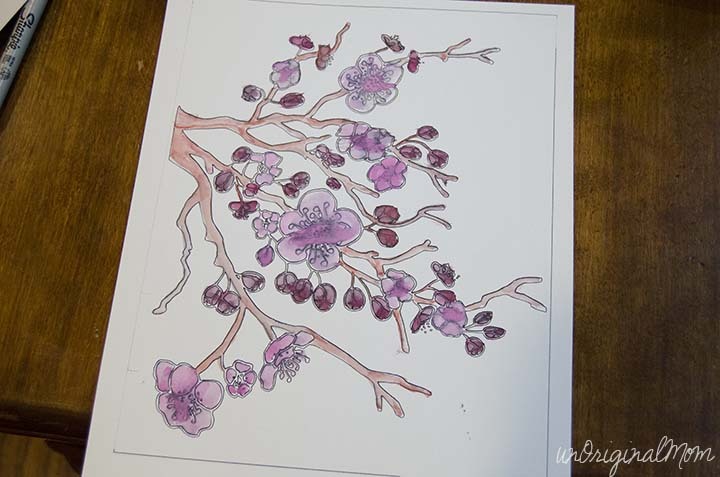 So I thought I could create my own “paint-by-number” cherry blossom watercolor art, using my sketch pens to make an outline I could paint inside. I found an image I liked, traced it in Silhouette Studio, then used a black sketch pen to sketch it onto watercolor paper. Next, just had to paint inside the lines with watercolors. Pretty fool-proof, right? Yeah, not so much. I suppose I could have put it on the wall and claimed that my 2-year-old painted it. Oy. Problem #1 was that the sketch pen ink bled. I should have used my pen holder and a fine point sharpie or even a ball point pen, and I would have had much better results. Problem #2 was the design just didn’t lend itself very well to the paint-by-number kind of technique that worked so well for Allison at Dream a Little Bigger. There was just too much small detail and overlapping color. Ah well, I just had to sigh and let it go. But wait! An idea struck just as I was resigning myself to the fact that this was simply not going to work. 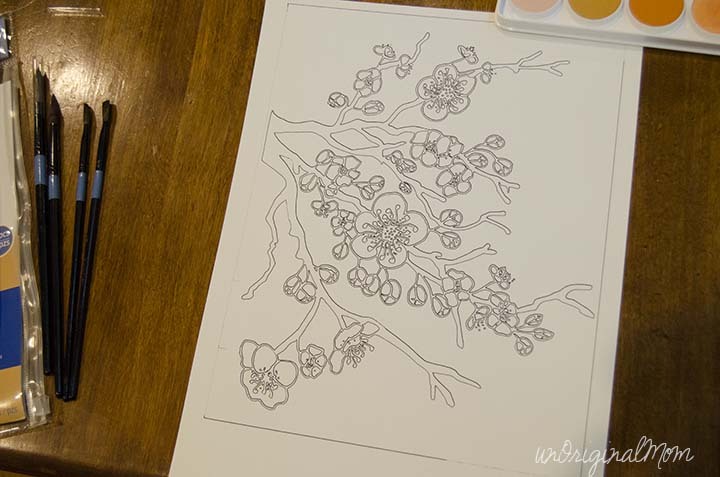 What about painting some beautiful shades of pink onto the watercolor paper, then using my Silhouette to cut out and piece together paper cherry blossoms? Crazy idea, but it just. might. work. So I found a shape in the Silhouette store and painted 3 different pieces of watercolor paper with shades of pink, green, and brown. Even I could handle that. 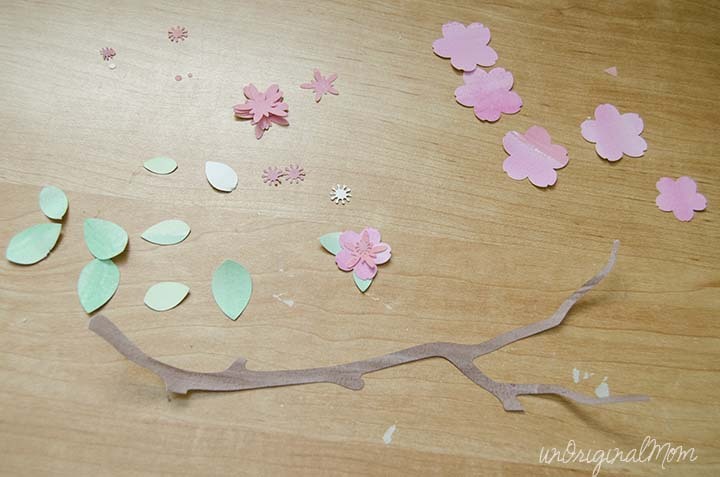 Then I cut out flowers of varying sizes, along with a branch shape (I used the knife tool to slice of the blossoms from that shape and just used the branch). Things were looking promising! I was loving the variety of color and texture of all the different pieces. Next step was to assemble all the flowers. 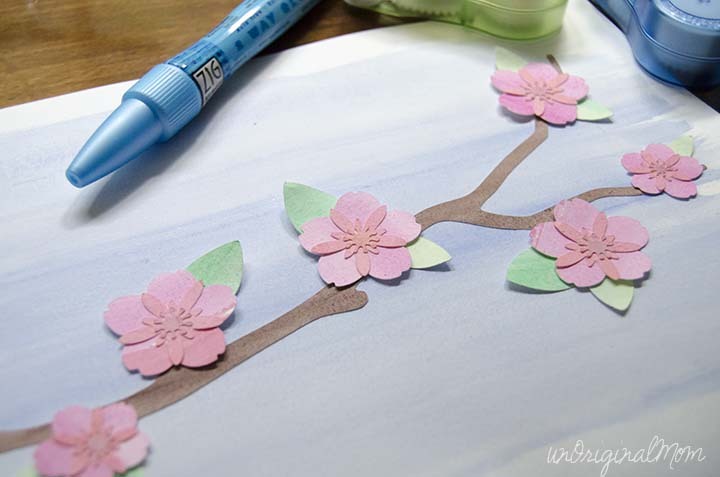 And finally I glued my branch to another piece of watercolor paper that I had painted a light blue, to really give it that washed out watercolor kind of look. I have a feeling I will be using this technique again and again. 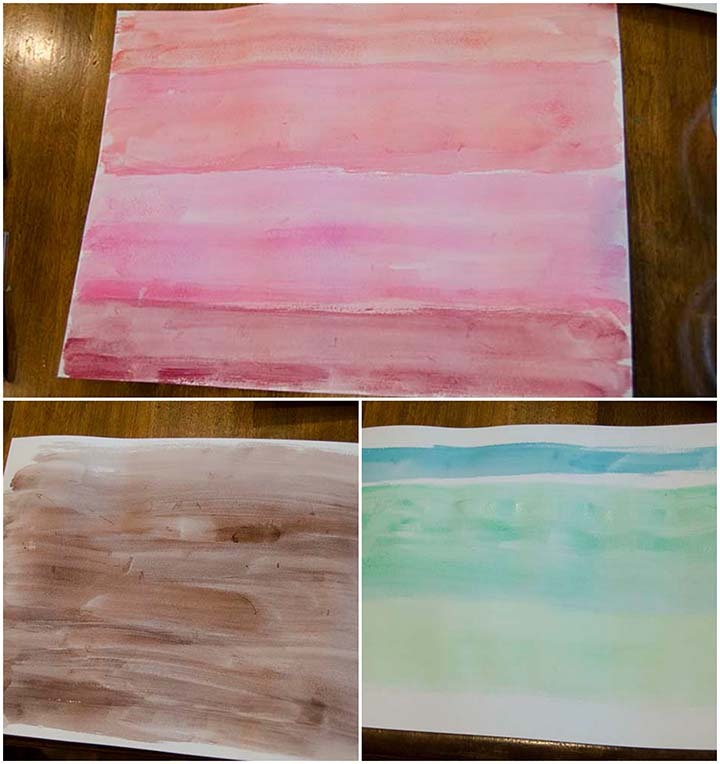 When you paint with watercolors on watercolor paper, no area of the paper is exactly the same shade, so you get a neat effect of texture and color. 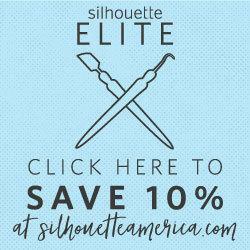 Great for any kind of paper crafting! And to think – it was all because of a craft-fail! It just goes to show you that you can find inspiration anywhere! 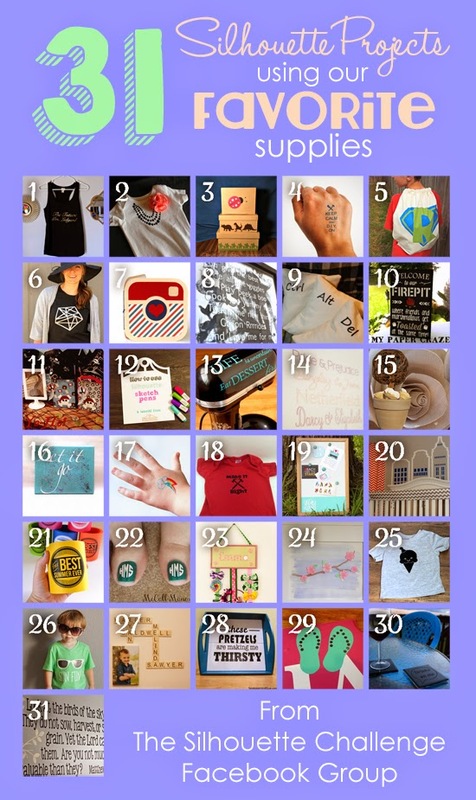 I’m excited to share with you 30 more Silhouette projects that some of my bloggy buddies have concocted using some of their favorite materials! While I love having theme posts for inspiration on particular materials or seasons, sometimes it’s nice to see what folks create when there are no boundaries – creativity can really take hold and shine through! So be sure to take some time when you’ve got it and browse through all of these projects – you’ll be sure to be inspired. Have YOU had any craft fails with happy endings? Leave a comment – I’d love to hear your story! THIS IS AMAZING! I love how you did this, seriously! INCREDIBLE!! Meredith, this is so lovely! And it’s great to see how you turned a craft fail frown upside down! Okay, maybe that was a super cheesy thing to say, but in all seriousness, fabulous job! So pretty Meredith! I love the 3d look it has! This is so pretty- wow! I love how you “saved” this project! I think it looks great.